JOG — airport code for Jogjakarta, commonly referred to as Jogja by locals, otherwise known as Yogyakarta. Boy, this Indonesian city in Central Java doesn’t make it easy, does it? That’s just the beginning. What til you get to the airport. 1. Book a seat toward the front of the plane so you can hurry off and line up at the one-man ‘Visa on Arrival’ window. Nearly half the flight were visitors to the country, so the line was long and snakes out of the tiny arrival area inside. It could not even hold a planeful of people. If you’re claustrophobic, maybe you’d be better off waiting outside. 2. No one asked to see my return ticket, but of course you should have one, just in case. 3. After you get your visa, you still need to go through the one-man customs & immigration desk to get your passport stamped. Then, once you have your bag, it needs to go through the customs security scan. This is all in the space about the size of a McDonald’s restaurant — if that. 4. Lots of people will offer to taxi you. Arrange your ride beforehand or you’re likely to get ripped off. 5. SAVE SOME CASH!! 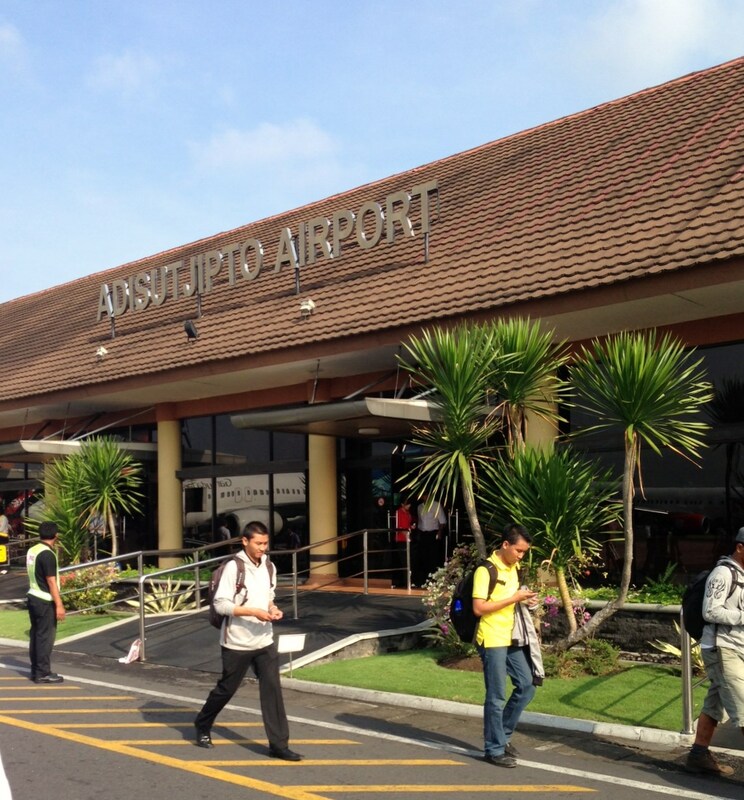 There is a departure tax of 100,000 rupiah (about $10) when you leave Jogjakarta. Cash only. Be prepared. Feeling like a millionaire. 🙂 I’m definitely looking forward to this trip! Haha! That’s making me wish I’d spent my days as a millionaire a little more lavishly. yes, every western said so that everything is cheap here in Indonesia as currency exchange. so how the stories during you’re in jogja? My stories are coming up, but I agree — things were very cheap compared once I left the airport. I found some beautiful batik, too. We’ve got our eye on it as a destination this year so keep talking! I will! I just wish I’d had more than a rushed weekend. I know I missed so much. After you return, I’ll look forward to reading about what you found there. One-man? Maybe they are working with budget cuts? Maybe. But there’s really just room for one person. You will love the temples. I can only imagine the pictures you’ll take, Madhu!